In view of multiple serious issues with some developers putting items that unsuitable for IMVU (UFI) in the General Audience (GA) section in the last 2 weeks and about 10-20% of GA female clothing items are actually only suitable for Access Pass (AP), AnakaTarren has written a guide to Maximize Your Flagging Results for Rating Violations. Her goal in writing this useful guide is to help root out the serious, repeat, TOS-ratings violators, specifically those who regularly mis-rate their items as GA. Finally, budget “bar” is rated appropriately! 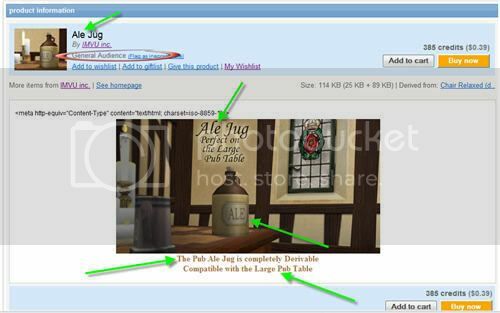 r.-idf-bar had its rating set to Restricted by an IMVU administrator on October 23, 2007 due to an IMVU user has complained that it was inappropriately rated because of Alcohol Use and Reference. Few days ago, r.-idf-bar had its rating set back to General Audience by IMVU staff. However, no message from IMVU for letting me know about this. Anyway, this budget “bar” is rated appropriately FINALLY! Thanks CuteBirdie for informing this good news to me.